Audio content on Internet comes in two versions: the one that you intentionally play (YouTube videos, Spotify songs, etc. ), and the annoying one that plays automatically (ads, or notifications). When you want do disable the second kind, all browsers require you to do it manually, which can be as annoying as hearing that sound. For Google Chrome users, that doesn’t have to be the case anymore. With one handy extension for Google’s browser, you can block sound from any site you want, and avoid hearing unwanted audio. The extension is called Silent Site Sound Blocker, and you can download it from Chrome’s Web Store for free. 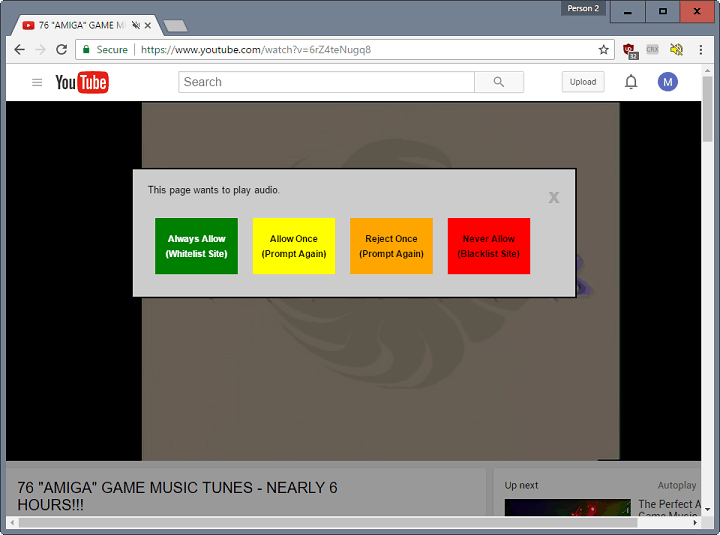 This extension serves as an audio firewall for Google Chrome, and gives users complete control over audio playback in the browser. It comes with a few modes and options, so you can choose the regime that fits you the best. “Allow Whitelisted Only — This setting plays audio only if the site is found on the whitelist. Block Blacklisted Only — This plays audio on all sites except on sites that are on the blacklist. Silence All Sites — This blocks audio playback on all sites. By default, the extension allows playback only from whitelisted sites (the first mode), but you can easily change that. Whenever you open a site that tries to play audio content, a prompt asking you for permission to play the sound will pop up. From there you have an option to whitelist the site, play audio and reject it only once, or completely blacklist the site. You can also whitelist and blacklist sites manually. This prompt shows every time a site tries to play audio, as there’s no way to disable it. This, as well, can be annoying to some users, but it’s definitely better than hearing that guy who tries to show you how to make a million in one month. All in all, this is a very useful extension, if you don’t want to disable audio on each site manually. You can download it for free, from the Chrome Web Store.